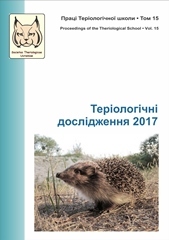 The volume deals with current research on mammals mainly of the fauna of Ukraine, but also Belorus and Poland. In total, there are 20 contributions in this volume, grouped into 6 sections: Fauna and Communities (5), Mammalian Ecology (4), Mammal Distribution (4), Zoonoses and Factors of Mortality (4), Mammalogy Notes (2), and History of Research (3). About one third of the articles (7) were prepared in English, while all articles have extended English summary (about 1000 characters) and translated into English titles of tables and figures, as well as translation into English all of the cyrillic references. 12 articles were prepared in Ukraine and 1 in Russian. Proceedings of the Theriological School. 2017. Vol. 15. 180 p.
Праці Теріологічної Школи. 2017. Том 15. 180 с.